I’m jumping straight into this dessert. Number one: it’s pronounced cla-foooooo-teeeee. Number four: We jumped straight into this dessert before I could properly photograph it. Doh! This french-based dessert is a mix between custard, flan, heaven. 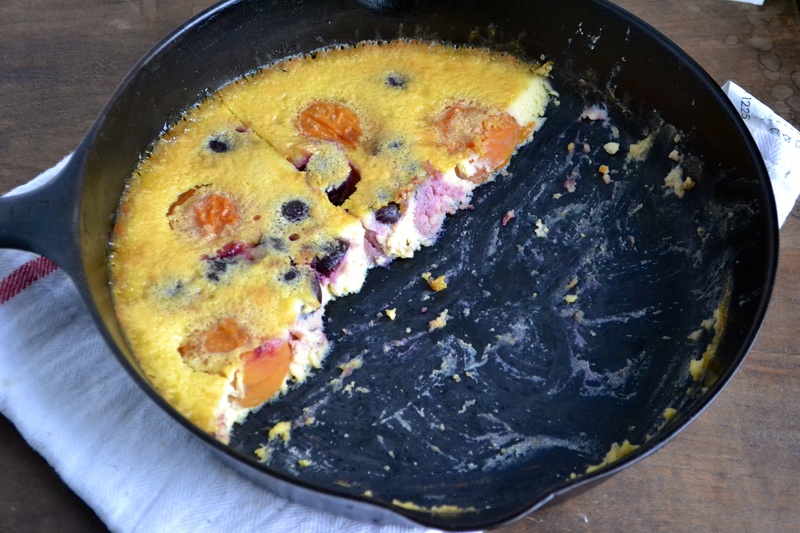 Traditionally, clafoutis contain a little bit of all purpose flour, whole milk, eggs, sugar, and whole cherries that have not been pitted. The pits give off an amazing almondy flavor. But who wants to be enjoying a creamy amazing dessert and then break a tooth when you bite into a surprise pit. And then have to spit. Mmmm. Fancy. 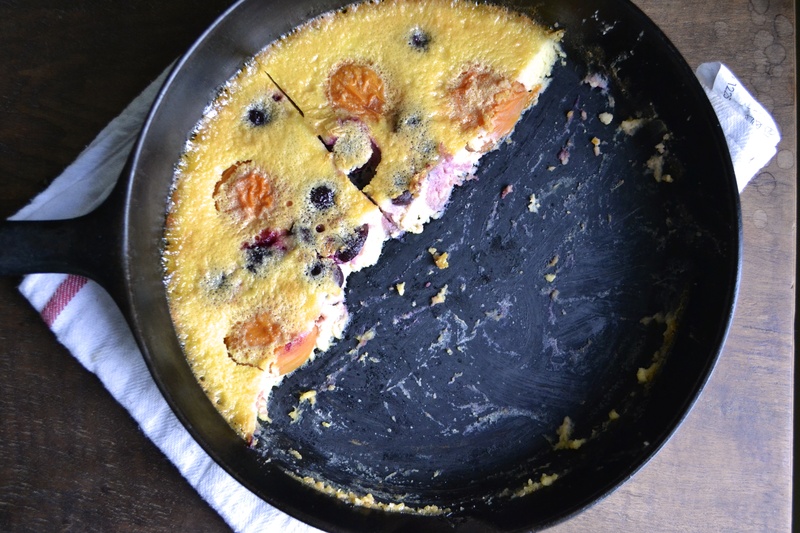 So when coming up with a grain free clafoutis recipe, using almond flour seemed like it would work wonderfully and provide that almond flavor naturally. I scoured through several different recipes and finally landed on this one from Gourmande in the Kitchen. I slightly adapted it, by adding the zest and juice of one lemon, a tablespoon of coconut flour to thicken the mixture (making it more sturdy and creamy), and honey instead of sugar. A friend brought me some fresh Michigan sweet cherries and apricots that she brought back from her vacation. We ate most of the cherries, but I managed to squirrel away a batch for this clafoutis. 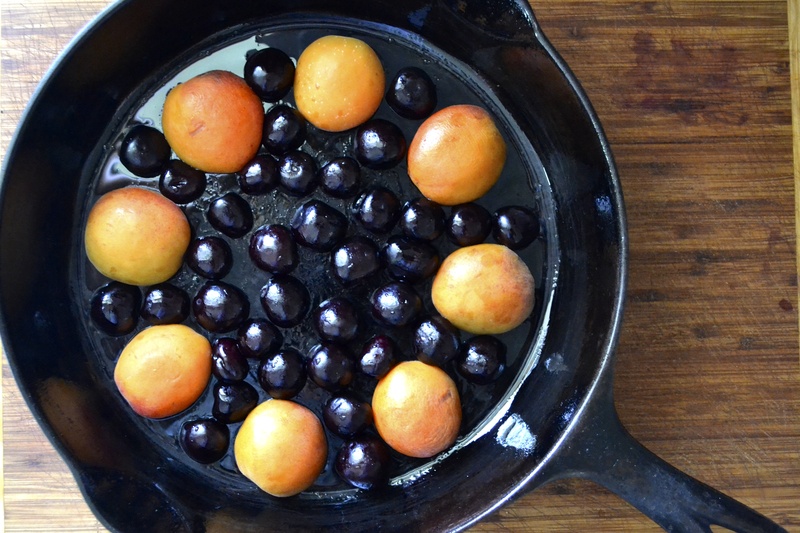 Halve and pit the cherries and apricots and then place them into the bottom of a cast iron skillet. You could also use a 9-inch pie pan, cake pan, or a shallow tart dish. Simply place all of the remaining ingredients into a blender or food processor and whirl together for one minute. Then bam! Pour the custard filling on top of the prepared fruit. Then pop this baby into the oven and 45 minutes later, you have a light, creamy, and amazing dessert. The best thing about this dessert is that you can prepare a stunning dessert for company without having to worry about it. You can focus on the main course, or a side dish…or your drink and company! 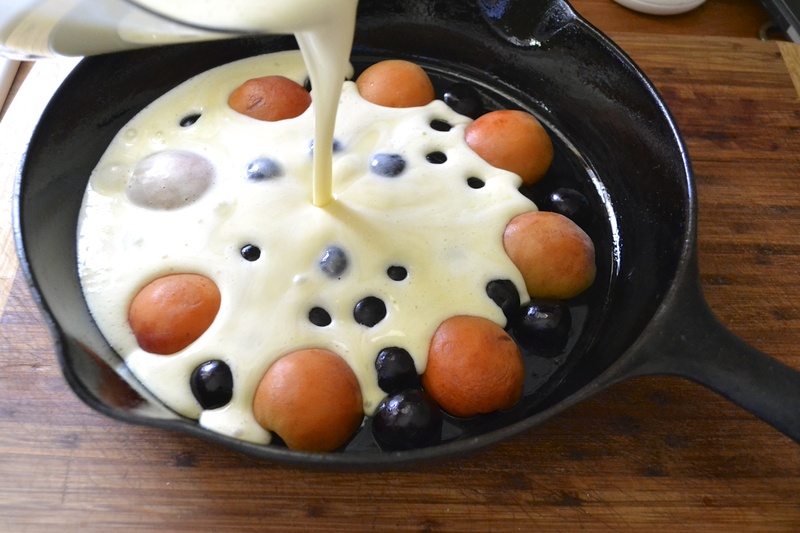 If you don’t have cherries, no worries, I also have prepared this clafoutis with blueberries. It would be awesome with any fruit that is in season…pears, apples, peaches, raspberries, blackberries…plums! Preheat oven to 375 F. Butter or grease a 10-inch cast iron skillet or 8X8 inch pyrex dish or even a 9-inch round pie pan or cake pan will work. 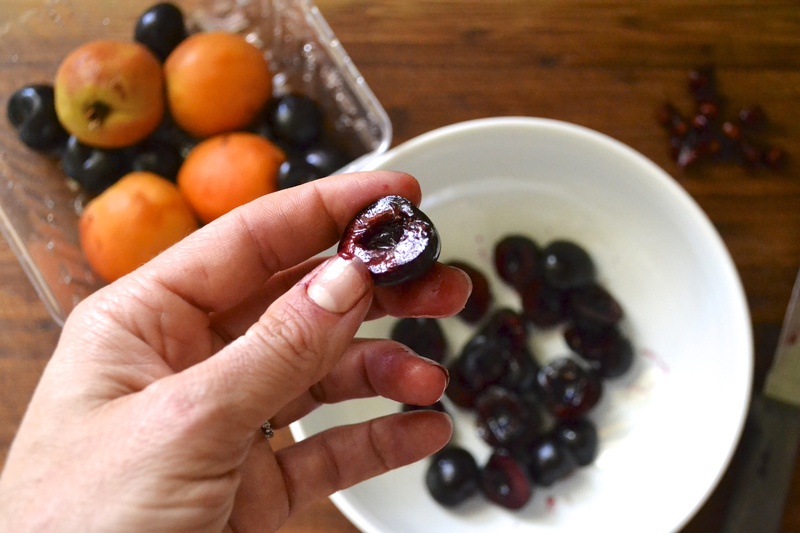 Place prepared and pitted cherries and apricots in the bottom of the prepared baking dish. Arrange in a single layer and evenly disperse the fruit. Meanwhile, place all of the remaining ingredients (coconut milk through salt) into either a blender, food processor, or bowl of a mixer. Blend or mix on high for 1 minute. Gently pour the mixture into the prepared baking dish on top of the fruit, being careful to not disturb or dislodge the fruit. Place into the preheated oven and bake for 35 to 40 minutes, or until set. Remove from oven and allow to cool for 10 minutes. Serve warm or at room temperature. Happens to me all the time (diving into dessert before trying to get a pretty photo). What can I say, I’ve got priorities!